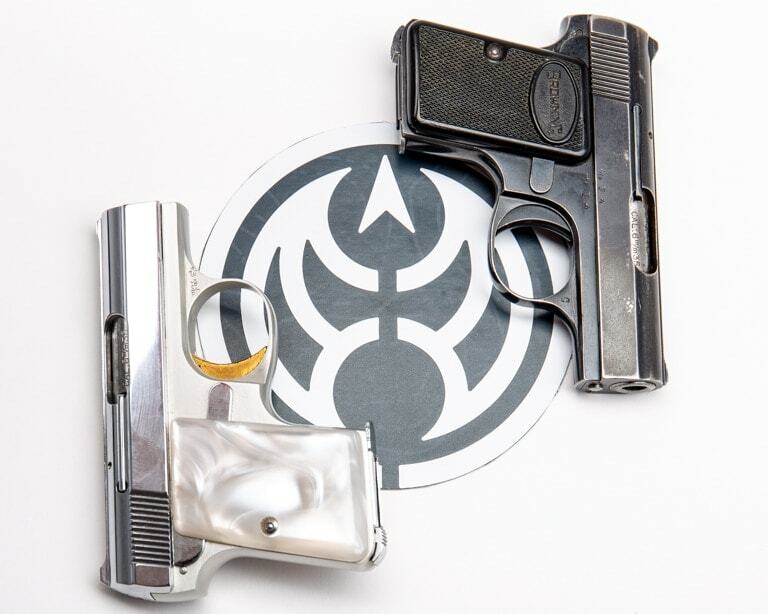 From the wide range of options in the Guns.com Warehouse, we bring you one of the smallest and best-made micro guns to come from Belgium in the 20th Century. John Moses Browning was truly the Willy Wonka of guncraft, designing everything from the big medicine of the .50-caliber M2 heavy machine gun, to much more compact palm-sized handguns. One of his classics in the latter category was a slim, six-shot .25ACP blowback-operated handgun that weighed about 13-ounces and used a rear grip safety much like the one later seen on his M1911. This early Browning grew into the Colt 1908 Vest Pocket and a slightly modified variant was sold by FN in Belgium as the Model 1905 for decades. 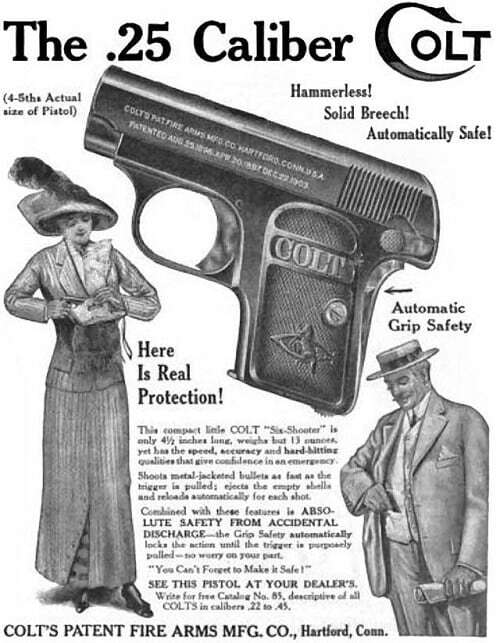 Colt’s 1908 Vest Pocket and the very similar FN M1905 were designed by John Browning and were the basis of the Baby, which followed in 1927. With a 2-inch barrel, these guns went just over 4.5-inches overall, making them easy to stash in a coat pocket of the day. Popular, Colt and FN sold somewhere in the neighborhood of about 1.5 million of these little hideout guns. Fast forward to 1927 and, with Browning’s passing the year before, FN moved to update the popular design. That’s where Belgian small arms guru Dieudonné Saive (who later finished the Browning Hi-Power and designed the FN-49 and FAL) came in. Working with the original Model 1905 as a baseline, Saive dropped the grip safety in favor of a manual thumb-operated safety lock that doubled as a hold-open. 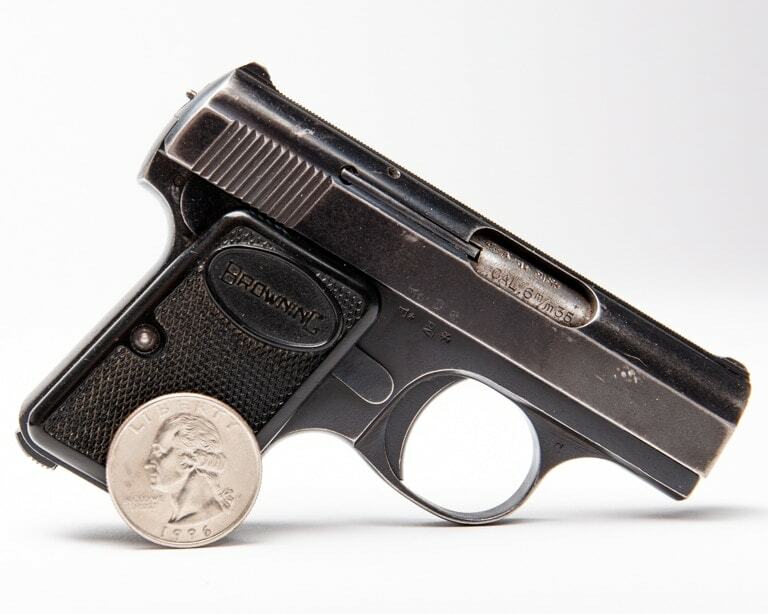 Lighter, weighing just over 9-ounces while still being an all-steel pistol, the gun was sold from 1931 onward as the Baby Browning. Early models were marked with an “FN” on the top of the grip panels, while the word “Baby” was on the bottom. Firearms writer Anthony Vanderlinden details that some 50,147 of these guns were produced by FN in the decade before the assembly line was interrupted by World War II. Then, after the U.S. market opened up and the guns were sold there via the Browning Arms Company in 1954, the gun caught on, with over 13,000 shipping to the states that year alone. By 1968, production had ramped up to more than 42,000 Babies per year. Then came the Gun Control Act of 1968. Signed by President Lyndon B. Johnson, the legislation regulated both interstate and foreign commerce in firearms, including a provision that banned the import of small handguns unless they managed to meet a complicated point system to be eligible for importation. This blocked the Baby Browning and several other compact handguns such as the Walther PPK from coming in. With that, production in Belguim dwindled after 1969 until it transferred to the MAB factory in Bayonne, France to be made in small numbers for continued sales outside of the U.S. When the line finally ended in 1983, some 505,181 of the cute .25-caliber pistols had been produced over the course of a half-century– with most of those in the heydey of the gun’s American success between 1954 and 1968. The Baby was rumored to have seen service with the French Resistance and the U.S. Air Force. The first tale has some basis in fact, with Resistance fighter Jacques d’Andurain later detailing he fired the “first shot” of the fight in occupied France against the Germans with a Baby Browning. 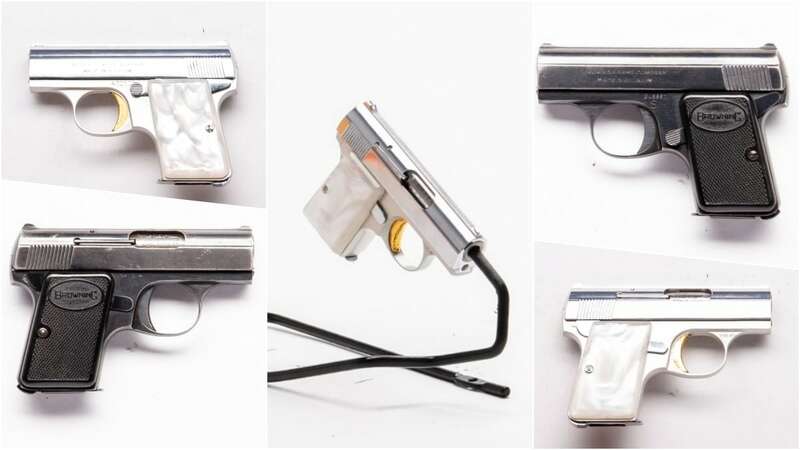 The latter rumor, widely repeated, cannot be confirmed and is unlikely as the USAF used a series of .38-caliber Colt and S&W revolvers for aircrew “bailout” purposes throughout the period that Browning was making their lilliputian .25 squirt gun. Nonetheless, the Browning Baby also appeared notably on the big screen in Fritz Lang’s 1944 film noir spy classic Ministry of Fear as a plot point involving a natty nickel-plated model swiped from a purse and later used to good effect. On the small screen, Babies popped up extensively in the 1960s spy show The Man from UNCLE. Since 1969, other than the dwindling supply of pre-GCA imported Babies in the U.S., the only other option was to go with a gun built by Precision Small Arms, who has been making licensed copies of the design under their own banner as the PSP-25 off and on since 1984. Still, there is nothing quite like a Belgian-made Baby. To see more on this fascinating gun and the rest of our ever-changing inventory, head over to our handgun section. 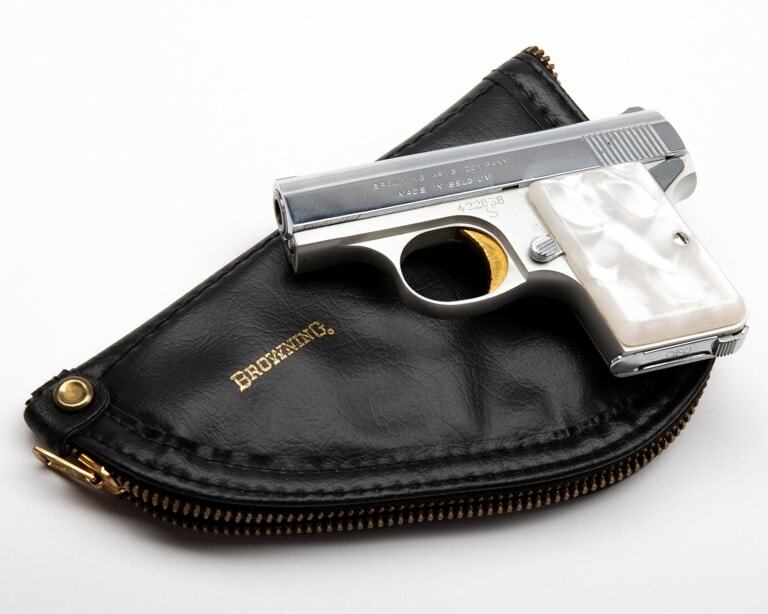 The post From the GDC Warehouse: The super compact Baby Browning (PHOTOS) appeared first on Guns.com.